642 King Street West, originally built in 1894 as a piano factory, offers the best of old and new. The full renovation of the complex unlocks valuable mid-block retail opportunities and better street frontage along King. Typically King West, this brick-and-beam property was built on a skinny but deep lot, with a raised ground floor fronting King. There were multiple additions to the rear, and a carriageway designed for horse-drawn carts. Many of its original features had been altered, covered up or removed over the years. 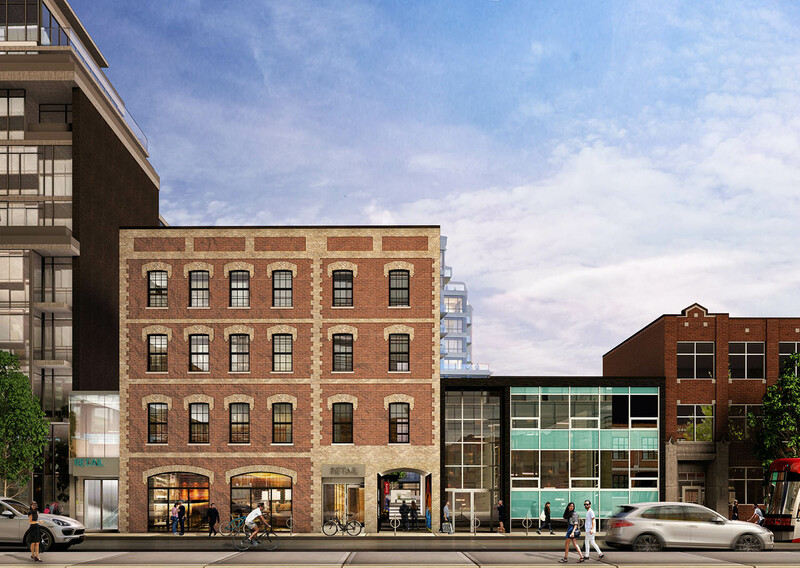 Wanting to expand its offering of premium office and retail space along King West, Allied's project goals were deceptively simple: Upgrade the building to meet current building code requirements, and to enhance the heritage character of the building while doing so. The solutions designed for the building, however, turned out to be far from simplistic. The team had a vision for a clean, rational and easily leasable interior space. After thoroughly parsing through haphazard layers of additions and old tenant improvements, the final design presented a scheme made to look, feel and function like a coordinated entity while providing flexibility for changing tenancies. The structure and floors were reinforced with concrete and covered in wood to increase the carrying capacities and fire safety of the building while maintaining the original look and feel. Between moved stairwells, replaced elevators, re-graded building entrances, reinforced structures and reconfigured load-bearing walls; close to everything in the building was augmented to accommodate the tight cluster of new uses envisioned for the space. The result is a highly accessible and attractive historic property with spaces of distinguished and unique quality in the King West neighbourhood.